The name of this lieu dit comes from the Latin "Dominus" meaning "master" and referring to the fact that the lord of the manor of Savigny owned the vineyard. It is an east-facing vineyard with a clay and sand soil. 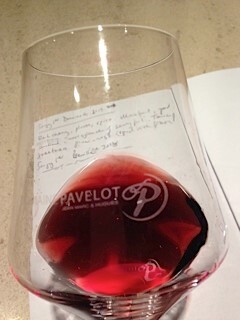 The initial nose is of black cherry, plum, nutmeg and cinnamon. Really good fruit from the mixture of old vines (45% are 80 years old), middle aged vines (32% are 40 years old) and young vines (23% are 10 years old). There is a lovely cylinder of pinot berry fruit. A touch of sweetness. The quality of the vineyard work and timing of the harvest really shows through. Good finesse. Scores 23-25/30 for a Savigny 1er Cru.